Of businesses have reported a breach in the past year. Of businesses have admitted to not knowing if they’ve been breached. Of businesses claim they’ve not been breached in the past year, or they just don’t know it yet. Which of the above categories does your business fall under? Knowing what you’re protecting is half the battle. Our solution leverages the NIC to enumerate all your production traffic flows in all your servers easily, and seamlessly. You may even discover applications and flows you didn’t know existed. Imagine a hardware firewall in every server that is centrally managed with policies that ONLY allow individualized access to the server. Servers would ONLY respond to requests for access from authorized clients and ONLY on authorized ports that align with the policies for that specific server. Every server in your network is both cloaked and a honeypot at the same time. Attempts to enumerate your server architecture result in a storm of alerts to your administrators immediately warning them of an attack in progress. Also, zero actionable details are returned to the attacker so they have nothing to build on. Servers inside the data center are becoming more vulnerable to internal east-west attacks from other compromised user workstations or servers. Nearly 90% of all enterprise network traffic occurs within the data center. Applications create a volume of traffic which is astronomical and growing exponentially. 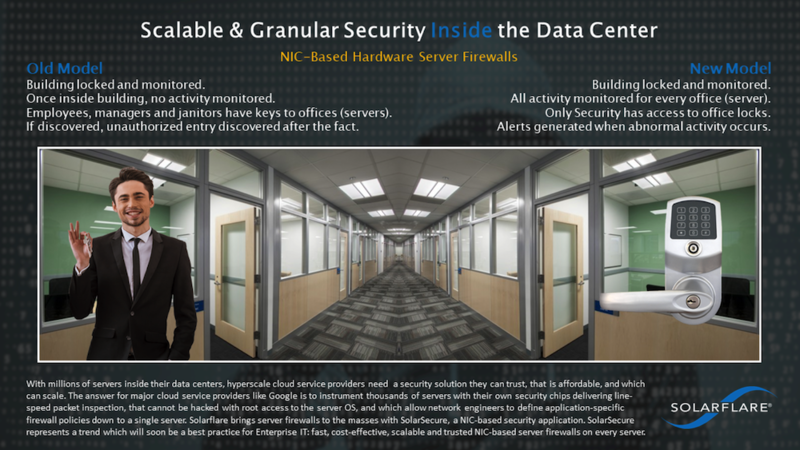 Data centers are the new bank vaults, and make an attractive target for devious and persistent attackers looking to steal your companies most valuable secrets. ServerLock secures your data centers one server at a time, using the NIC hardware itself. Solarflare provides the industry’s first Software Defined NIC with built-in hardware fire-walling, and security policy orchestration for every server in your enterprise. ServerLock discovers every application data flow within your network and enforces security policies that enable valid business transactions, while shutting down malicious attacks.